Won't it be posted at wmdportal.com? Nice Steelbook! Last edited by Raphael Klapczynski; 11-08-2014 at 13:49. I am looking forward to the behind-the-scenes book, although I am already behind the scenes (but not behind the blue ones...). Which version do us full members+ get? Last edited by YANNLEBLANC; 11-08-2014 at 13:48. Just a little thing a bout the marketing image used on amazon (http://ecx.images-amazon.com/images/...L._SL1500_.jpg): "cahier des développeurs" sound weird to me, "journal des développeurs" would be better IMO. Maybe some fellow french speaking members could confirm this ? When will it be available to pre-order as it only shows the standard versions in the online stores listed? 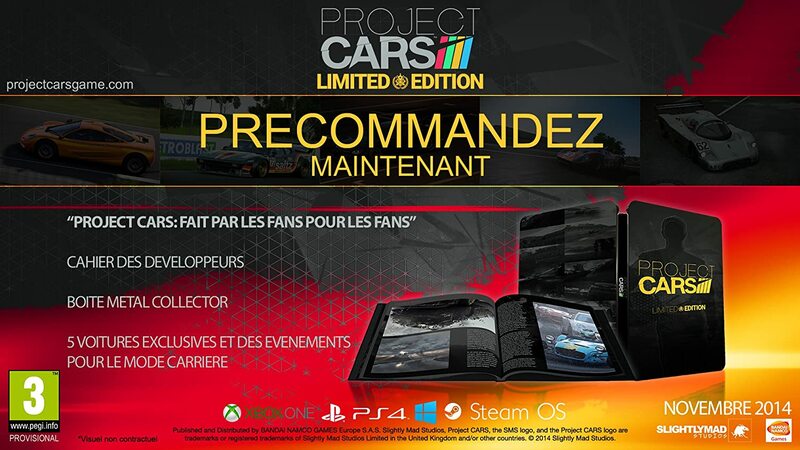 So we'll have cars that are only available though pre-order? Ah ballz, that's a worse separation than we'll have later with DLC anyway which everybody is fine with obviously. So now I need to ship another (I dunno) €60 to get 5 cars? Last edited by Andreas Knopke; 11-08-2014 at 14:27. Huh so, BMW M1 and Sauber C9, only with limited edition? What's up with that?